My question here is: Which is the right direction of the transcript that produces the reads, knowing that the RNA-seq has been done in Single end? So, the reverse complement of these reads is aligned in the genome Is this meaning that the direction of the transcript is the reverse sens of the genome ? What if I look again in the image : the red reads are aligned in the same sens as they are in the fastq (RNA reads). 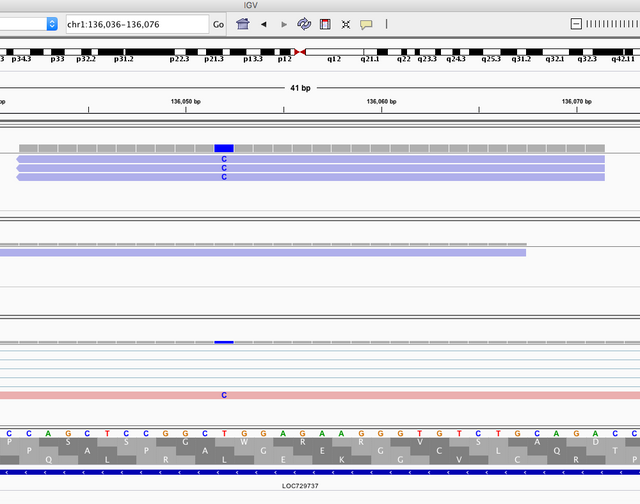 So, I might say that the transcript direction is the actual direction of the genome showed in the image? cDNA synthesis and library generation performed according to TruSeq Stranded Total RNA Sample Preparation protocol (Illumina). mRNA-seq libraries was subjected to sequencing on a NextSeq 500 instrument (Illumina) to yield 75 bp single-end reads. Is your RNA-seq from a stranded or unstranded protocol/library prep? I'm not sure about the ribo-seq reads, but TruSeq stranded reads are in the opposite direction of transcription. Thank you very much for your answer. I figured it out: as you said TruSeq stranded reads are in the opposite direction of transcription whereas ribosome-seq reads will be in the direction of transcription.